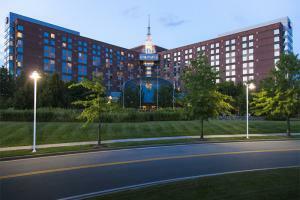 Located just minutes away from downtown Boston, this airport hotel offers convenient direct access to the terminals. Guests are just moments from the Boston Convention Exhibition Center and Seaport World Trade Center. The hotel offers a modern fitness center, a heated indoor pool, and a 24-hour courtesy bus to the airport terminals, subway and water taxi. Guests can unwind in modern guest rooms featuring soundproofed windows, most with spectacular views of the city skyline. Located in Boston, Massachusetts, connected directly to the terminals via the sky bridge.